Automated Linux Data Recovery Software to recover lost data from Ext2, Ext3 Partitions of Linux operating Systems. It Runs on Linux Platform and Windows Platform. create expiring and secure download links for the delivery of digital goods. IP locked download links, country locked download links - the fully featured PHP solution. When OpenOffice.org 1.0 was released, no one could believe that software this good could be free. An estimated 16 million+ people have downloaded the software; many more have installed it from CDs or were passed copies by enthusiastic users. is the ideal charting and graphics component library for web servers and for embedding in applications.License for royalty free redistribution of ChartDirector runtime on Windows, Linux or FreeBSD. Grants the right to embed ChartDirector runtime in a product or system that is not for ChartDirector software development. AIOCP is a professional all in one solution to completely manage a website through a userfriendly web-interface. AIOCP can be also used as a platform for building powerful internet solutions, ranging from e-commerce, portals, websites and intranets. is a translation layer (a program loader) capable of running Windows applications on Linux and other POSIX compatible operating systems. Windows programs running in Wine act as native programs would, running without the performance or memory usage penalties of an emulator, with a similar look and feel to other applications on your desktop. is the first complete Linux package to harness both the improved Linux kernel 2.6 and the recently enhanced GNOME 2.6 and KDE 3.3 user desktop environments. is an expansion of the UNIX GUI utility called 'xclipboard' that allows users an quick and easy way of printing, managing, and saving to disk, multiple clipboards. uses the most advanced multi-platform virus inspection technology which scans for viruses and other malware on your personal system. 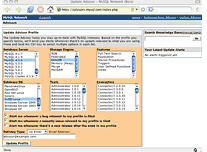 is the new and complete visual development tool for building and managing mission-critical pure Java applications. is used by network professionals around the world for troubleshooting, analysis, software and protocol development, and education. - provides an advanced architecture for desktop applets -- tiny displays sitting on your desktop in a symbiotic relationship of eye candy and usefulness. is a single process stack of system monitors which supports applying themes to match its appearance to your window manager, Gtk, or any other theme. is an image viewer for Unix operating systems (developed on Linux). It's key features include single click file viewing, external editor support, thumbnail preview, and zoom features. 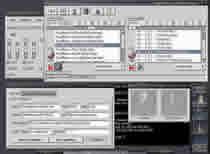 is a CD and DVD burning application for Linux systems optimized for KDE. is sophisticated file transfer program with command line interface. It supports FTP, HTTP, FISH, SFTP, HTTPS and FTPS protocols. GNU Readline library is used for input. is a sophisticated administration system for the Linux operating system. In many ways, Linuxconf is different from other administration schemes found on Unix operating systems and most other systems. is a special program for converting audio-cds to mp3/ogg-format. It is a frontend for every grab-program and mp3-encoder. is a read-only compressed file-system emulation. It allows executables to uncompress their data files on the fly.